McSorley's on East 7th Street. That's Charlie and John on the right. … With a Delicious Ending. 9 a.m., Wednesday, April 21, 2010. My friend Charlie Reilly and I took off from suburban Philadelphia by car to Hamilton, N.J., where we boarded a Jersey Transit commuter train to New York City's Penn Station. Incredibly, every paved parking spot at the station was already filled, so we had to park in an old overspill lot. When we asked the conductor why so many people were heading for the Big Apple he replied "because it's Wednesday." It turned out that Wednesday is Matinée Day on Broadway, attracting thousands of Jersey housewives. Once there, we took a Fifth Avenue bus past my old studio down to Washington Square, where by prearrangement we met Charlie's friend, John. From there we more-or-less followed a variation of the route I described in my 2004 guidebook, Daytrips New York. After soaking up the atmosphere of Greenwich Village we headed over to the less-explored East Village, following The Bowery up to Astor Place and the old Cooper Union building of 1859. It was here, on February 27, 1860, in the Great Hall, that Abraham Lincoln delivered the historic anti-slavery speech that won him the presidency later that year. The very next day following our walk another president spoke here. That was Barack Obama, who addressed a group of Wall Street bankers, chiding them for their "failure of responsibility" and calling for tighter regulation of their industry. Lincoln and Obama were not the only presidents to have given speeches in this room — others include Grant, Cleveland, Taft, Teddy Roosevelt, Wilson, and Clinton. By now we were hungry and, more to the point, thirsty. Fortunately, just around the corner from Cooper Union stands the world-famous McSorley's Old Ale House, here since 1854 and virtually unchanged since then. Oh, they do allow women in now, following a 1970 lawsuit. Tradition has it that Honest Abe imbibed here after his famous speech. McSorley's serves their own ale, and only their own ale, dark or light, two mugs at a time. The prices are quite reasonable, but don't ask for any other beverage because they don't have it. They do have food, a selection of inexpensive sandwiches and hot meals from a daily menu on a chalkboard. Ten dark ales coming up … our table was the one to the right, but that's not us. This photo was swiped from Wikipedia.. Prohibition, that vile social "reform" of the 1920s, hardly affected McSorley's, which continued to serve their own ale as if nothing had happened. The fact that this was a popular hangout for politicians probably helped avoid police raids. Back then it was brewed in the basement; today it's made by a major brewery and sold in bottles throughout the nation. With an atmosphere reminiscent of Olde New York, McSorley's walls are covered with faded memorabilia, none of which has been removed since 1910. The floors are still covered with sawdust, the waiters and bartenders still emphatically Irish. And the suds, called "the ale which never lets you grow old," by the poet e.e. cummings, remains unchanged to this day. McSorley's old motto, "Good Ale, Raw Onions and No Ladies," however, is no longer in effect following a 1970 court ruling concerning gender discrimination. Its remaining mottos are "Be Good or Be Gone" and "We Were Here Before You Were Born." The definitive book about McSorley's (and a few other New York oddities) was written in 1943 by Joseph Mitchell under the title McSorley's Wonderful Saloon. It is still in print and available on Amazon (see below). To learn more check out McSorley's own website (click here). Thirst sated, we wandered through Cooper Square, passing Lafayette Street and Broadway to LaGuardia Place, where we stopped at an outdoor café for a final libation before returning to Penn Station and home. Near the café stood a statue honoring the "Little Flower," Fiorello H. LaGuardia, New York's exceedingly colorful mayor from 1934 to 1945. That's him on the right. Beer lovers, rejoice! Bamberg's citizens down more of the brew than anyone else. And there's a lot more to enjoy in the beautifully-preserved corner of Bavaria. I've been featuring it in my travel guidebook Daytrips Germany ever since the first edition way back in 1984, and the place remains as enjoyable as ever. Of all the medieval cities in Germany, Bamberg stands out as perhaps the one least touched by the ravages of war. Well over a thousand years of history enrich this ancient ecclesiastical and commercial center in Upper Franconia. It is a place filled with picturesque corners, charming waterfront houses and narrow, winding streets, as well as magnificent churches whose spires cap the seven hills on which it is built. Although this area has been settled since the late Stone Age, the earliest documented reference to Castrum Babenberg, as it was then called, dates from AD 902. Bamberg was well established as a center of learning before the 12th century. Despite occupation by the Swedes during the Thirty Years War, the town was spared the destruction of the Reformation and remained true to the Catholic faith. It was not until 1802 that it was secularized and made a part of Bavaria. Industrialization began in the late 19th century, but this took place at the eastern end of town, well away from its ancient core. Bamberg survived World War II virtually unscathed, and today offers visitors a chance to experience a city whose fabric has remained intact for centuries. This trip can also be made from other bases such as Nürnberg or Würzburg. Trains leave Munich's main station about hourly for the 2½-hour trip to Bamberg, which may require a change at Nürnberg. Return connections run until mid-evening. By Car from Munich, take the A-9 Autobahn to Nürnberg, then the A-73 to Bamberg. Bamberg is 232 km (143) miles north of Munich. Bamberg is compact and can be comfortably explored in any season. Some of its sights are closed on Mondays, Tuesdays, and holidays. The local Tourist Information Office (Tourismus & Kongress Service), T: (0951) 2976-200, W: bamberg.info, is at Geyerswörthstrasse 3, 3 blocks southeast of the Altes Rathaus. You might consider purchasing their Bamberg Card, which covers local buses, a guided tour, and entry to selected museums. Bamberg has a population of about 70,000. Leave the train station(1) and follow the map to the Kettenbrücke, a bridge spanning the Regnitz. You will probably see barge traffic on the river, as Bamberg is a major inland port. Cross the bridge and continue on Hauptwachstrasse. Walk straight ahead past Maximiliansplatz, with its "new" town hall and market place, and into the delightful Grüner Markt (2). This large open square, dominated by the Baroque St. Martin's Church and the 17th-century Neptune Fountain, is reserved for pedestrians. Obstmarkt leads to the Untere Brücke, a bridge over the left arm of the Regnitz. In the center of this stands the *Altes Rathaus (photo, top of page) (3), easily the most remarkable old town hall in Germany. Its extraordinary position in the middle of the river was determined by the local politics of the Middle Ages. At that time it had to administer both the ecclesiastical and civic halves of the city without showing preference for either, hence the truly mid-stream stance. Originally built in the 15th century, it was heavily reconstructed in the rococo style during the 18th. Among other things, the Old Town Hall now houses the noted Ludwig Collection of Baroque Porcelain and Faience. T: (0951) 871-871. Open Tues.-Sun. 9:30-4:30. €. Looking downstream, you will have a good view of the colorful fishermen's houses along the Regnitz, an area known as Klein-Venedig (Little Venice). After crossing the river, make the first left and then another left onto the Obere Brücke, which goes through the Old Town Hall, allowing a more detailed examination. Return to the left bank and stroll to a small footbridge from which you will have the best possible view of the Altes Rathaus and the 17th-century half-timbered building curiously attached to it. On the other side make a right at Geyerswörth Castle, built in 1585 as the town residence of the prince-bishop. Continue along to the next bridge and turn right. Midway across this you can stroll out on Untere Mühlbrücke for a wonderful view. Now follow the map through the Old Town to Domplatz, one of the most attractive public squares in Germany. The *Cathedral (Dom) (photo, above) (4), first consecrated in 1012 by Emperor Heinrich II, was rebuilt in its present form during the 13th century after two fires destroyed the original structure. It contains the only tomb of a pope in Germany, that of Clement II, who died in 1047 and is buried in the west chancel. The cathedral is exceptionally rich in works of art, the most renowned of which is the *Bamberger Rider (photo, left), a 13th-century equestrian statue of a king by an unknown sculptor. Just to the right of this is the elaborate *Sarcophagus of Emperor Heinrich II and his wife Kunigunda, carved in 1513 by Tilman Riemenschneider. Another masterpiece, on the west wall of the south transept, is the Marien Altar by Veit Stoss. The Diocesan Museum, adjacent to the cathedral, contains many more treasures, including the imperial cloak of Heinrich II and the robes of Pope Clement II. NEUE RESIDENZ (New Residence) (5), T: (0951) 519-390. Open April-Sept., daily 9-6; Oct.-March 10-4, closed on some holidays. €. This massive Baroque structure was erected between 1697 and 1703 for the very wealthy Prince-Bishop Franz von Schönborn. Step inside for a look at the magnificent Kaisersaal (Emperor's Room) and the luxurious apartments of the prince-bishops. 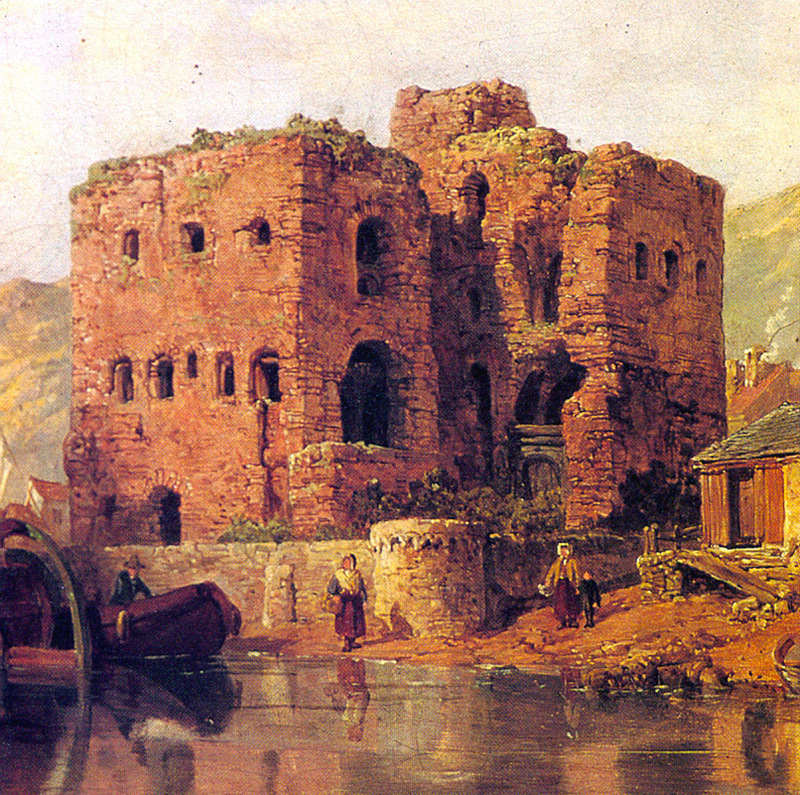 There is also a splendid art gallery with pictures ranging from the Middle Ages to the 18th century. While there, be sure to get out into the Rose Garden for a superb view of the town. Across from this is the Reiche Tor, a richly ornamented gate leading into the Alte Hofhaltung (Old Imperial Court) (photo, above) (6), one of the most enchanting sights in Bamberg. The grandiose, quiet inner courtyard is surrounded by half-timbered buildings and the remains of the old Diet Hall, which was used as the seat of local government for over 500 years after 1085. One wing now houses the Historisches Museum, with its exhibitions on the history and culture of Bamberg and Upper Franconia. T: (0951) 871-142, Open May-Oct., Tues.-Sun. 9-5. €. A gate at the rear of the courtyard opens into Domstrasse. From here follow the map to St. Michael's Church (7), part of a former Benedictine abbey originally founded in the 17th century. Inside, there are several interesting things to see, particularly the Tomb of St. Otto behind the high altar. Crawling through the hole in this is, according to local tradition, a sure cure for lumbago. The ceiling is also unusual, featuring paintings of over 600 different medicinal herbs. As you leave the church, turn right and amble out to the terrace, which offers a wonderful view of the surrounding countryside. FRÄNKISCHES BRAUEREIMUSEUM (Franconian Brewery Museum) (7), T: (0951) 530-16. Open April-Oct., Wed.-Sun. 1-5, closed Good Friday. €. Here is where the local art of making great beer is explored. This is particularly appropriate in a town whose average citizen consumes some 330 liters of beer a year, the world's record. The route back to the Old Town takes you by the 14th-century Obere Pfarre (Upper Parish Church) (8), considered by many to be Bamberg's finest Gothic structure. Turn right on Judenstrasse and take a look at the Böttinger House (9), one of the finest examples of a private mansion in the Baroque style. Built in 1713, it was the winter residence of the court privy councilor Böttinger, who thought of himself as the supreme ruler of Bamberg — although Prince-Bishop von Schönborn entertained similar notions. Böttinger also had another mansion, this one for summer use, just a stone's throw away on the Regnitz. Walk along the narrow Concordiastrasse for a block, then turn left and cross the tiny footbridge. In this area there are several old mills that have been converted into homes. An alleyway on the other side leads to the Mühlwörth, with an interesting view of Böttinger's other palace, the Concordia House (10) on the water's edge. Continue on past the locks of the former Ludwig Canal (11) for a short distance, then return and cross the Nonnenbrücke. Along the water, to the left, you can see two interesting old cranes. The very narrow E.T.A. Hoffmann House (12) on Schillerplatz was the home of that great romantic writer from 1808 to 1813. It was his stories that formed the basis for Offenbach's opera The Tales of Hoffmann. The house may be visited from May-Oct., Tues.-Fri. 4-6 p.m., and on weekends from 10-to noon. €. Now follow the map back to the train station. RETURN to Daytrips Sample Chapters Index. All throughout this blog there are references to beer and wine, two of the great joys of life. The most significant postings are listed below — just click on their titles to read. Prosit! Bamberg, Germany: Germany's highest beer consumption, home to a great beer museum, and home to the famous Rauchbier. Bokrijk, Belgium: The Flemish Open-Air Museum serves real country beers at outdoor tables as horse-drawn wagons go past. Faversham, England: Tour the famous Shepherd Neame Brewery and sample their "real Ales," then explore the delightfully unpretentious little town not far from London. Germany's Ammersee & Andechs Beer: Germany's finest is made by monks on a hill south of Munich, and served in their beerhall. Lüneburg, Germany. 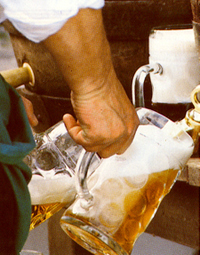 Visit the town's old Brauereimuseum, where beer has been brewed since 1485, then enjoy a glass or two of Krone Bier! McSorley's Old Ale House: New York's oldest Irish pub serves their own ale, and only their own ale, in this East Village landmark. Northern Burgenland, Austria: The tasty wines of the Neusiedler See district are best appreciated in the delightful village of Rust. Rüdesheim & Bingen, Germany: Germany's favorite wine village has been pressing the grapes for well over two thousand years. There's even an old castle with a wine museum! Salzburg, Austria: End your tour at the Stielkeller beerhall overlooking the city, then visit Stiegl's Brauwelt to explore the history of brewing. Strasburg, Pennsylvania: After a day with the old trains and a visit to the Amish Village, repair to the Twin Brook Winery for some local vintages. The Beers of Oji: Celebrating the wonderful beers we devoured while serving in the U.S. Army in Japan during the 1950s. Vienna's Kahlenberg Heights: End your day in one of the many wine taverns of Grinzing and Heiligenstadt with a glass or two of the local new wine. Wachau Valley, Austria: Float down the Danube and explore Krems, a gorgeous old wine town with the Weinstadt Museum and a Weingut where you can sample the local vintages. MORE TO COME AS I DIG THROUGH THE FILES! 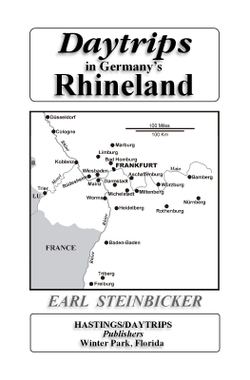 My new guidebook, Daytrips in Germany's Rhineland, has been selling fairly well on Amazon, so I'd like to celebrate by offering another free chapter. This one is easy to reach from the Frankfurt area, and will be enjoyed by anyone who loves good wine. That's the title page on the right. The little map on it shows all of the daytrip destinations. 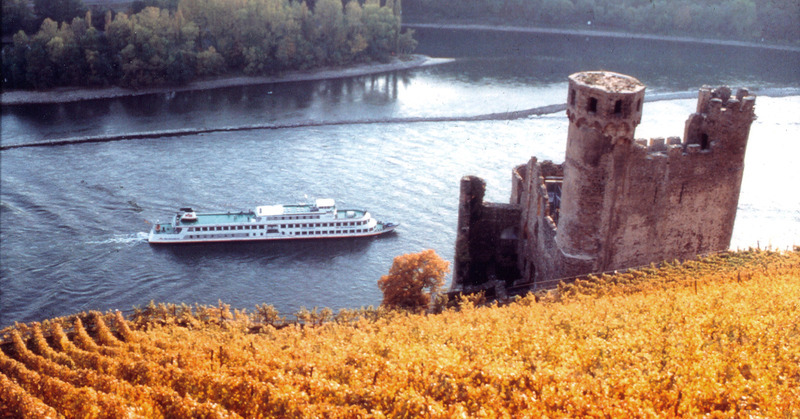 Wine lovers will rejoice in a trip to Rüdesheim, Germany's favorite wine village. The vintages have been flowing there for some two thousand years, ever since the Romans settled the area and began growing grapes. You can have a wonderful time sampling the result — some of Germany's (and the world's) best white wines — or in just exploring this delightful town and its surroundings. Whatever you do, you won't be alone. Rüdesheim is very popular with tourists from all over the globe, but you'll be seeing a whole lot more than most of them on this do-it-yourself daytrip. 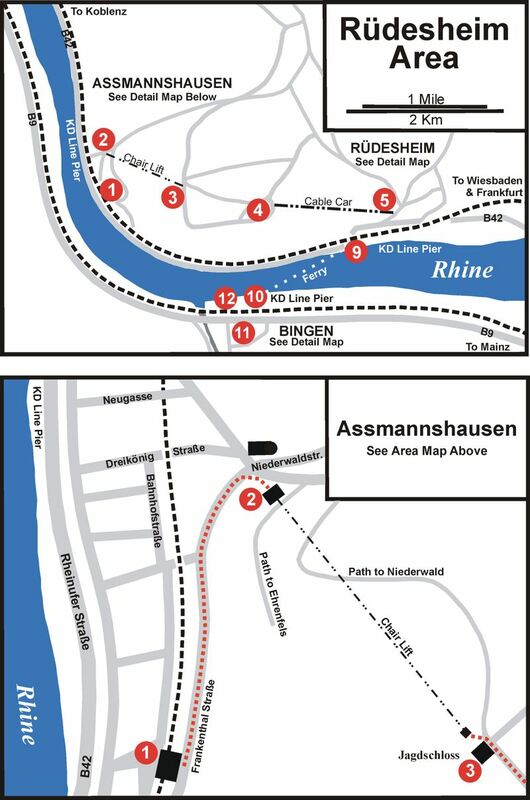 The suggested tour begins in the neighboring village of Assmannshausen and includes a ride across the Rhine to Bingen for an encounter with Hildegard. If these don't interest you, it is entirely possible to spend the whole day in Rüdesheim and not get bored. Tipsy perhaps, but not bored. Trains depart Frankfurt's main station for Rüdesheim several times each morning, some from the main level and some from the lower S-Bahn level. In addition, there are trains and buses from Wiesbaden, which is easily reached by S-Bahn commuter trains. The direct trip takes about one hour. Return service operates until mid-evening. Be sure to check the schedules carefully, especially to determine whether the train you want also stops in Assmannshausen. If not, it is only a short distance by bus or taxi from Rüdesheim. By Car, leave Frankfurt on the A-66 Autobahn and stay on it past Wiesbaden to Eltville. From there take the B-42 road into Rüdesheim, which is about 72 km (45 miles) west of Frankfurt. This trip should be taken between April and the end of October, when all of the attractions are open. Good weather is essential. The Tourist Information Office (Verkehrsamt) for Rüdesheim, T: (06722) 194-33, is at Geisenheimer Strasse 22, east of Hahnenstrasse. In Bingen, they are at Rheinkai 21, T: (06721) 184-205. Those making the complete tour should begin at the train station in Assmannshausen (1). Follow the map through this romantic old village, whose existence was first documented in 1108. Oddly enough, it is the home of Germany's best red wines. The narrow streets lead past several half-timbered houses and an interesting late-Gothic church to the chair lift (Seilbahn) (2). Purchase a combination ticket to Rüdesheim and be seated for a comfortable ride to the Niederwald. Along the way you will have superb high-level views across the Rhine Valley (photo, above). Getting off at the top, walk around past the Jagdschloss (3), a former hunting lodge of the dukes of Nassau. It is now a very attractive castle-hotel and restaurant complete with another panoramic vista. 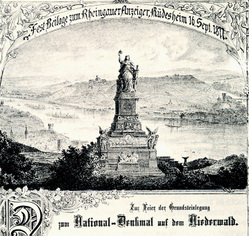 From here take a leisurely stroll of about one-half mile or so along a forest road to the Niederwald Denkmal (4) (engraving from 1877, left), one of the most colossal monuments in Germany. A late-19th-century expression of overblown nationalism, its heroic figure of Germania symbolizes the unification of Germany in 1871 and is still deeply revered by the German people — although to foreign eyes it may seem somewhat amusing. The enormous bronze relief depicting military heros surrounding Kaiser Wilhelm I and Bismarck, incidentally, faces France. There is a fabulous view across the Rhine. Take the nearby cable car (Seilbahn) down across the vineyards to its lower station (5) in Rüdesheim. Make a right on Oberstrasse to the Brömserhof (6), an aristocratic residence dating from 1542. The interior now features a curious exhibition known as Siegfried's Mechanical Music Cabinet, a collection of antique self-playing musical instruments. T: (06722) 492-17. Open March to Dec., daily 10-6. €€. Nearby is the Mittelalterliches Foltermuseum (Medieval Torture Museum), where you can delight in the imaginative use of torture during the Inquisition and other dark periods of history. Oberstr. 49-51, T: (06722) 475-10. Open April-Nov., daily 10-6. €. 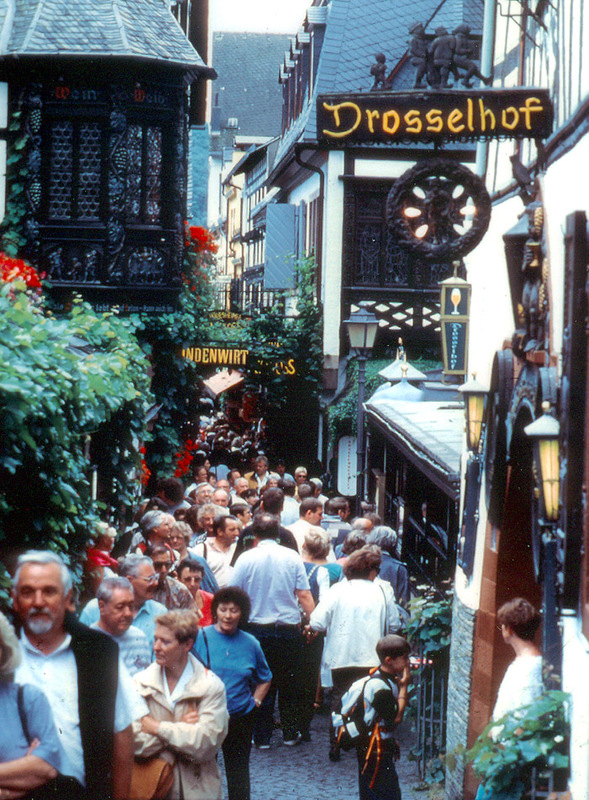 Rüdesheim is world-famous for the Drosselgasse (photo, above), a narrow lane that is usually jam-packed with hundreds of thirsty visitors. You may want to return here later to relax in one of its many colorful wine taverns. Until then, however, there are several other worthwhile sights. *BRÖMSERBURG (8), T: (06722) 23-48. Open mid-March through Oct., daily 10-6, last admission at 5:15. €. Formerly a refuge for the archbishops of Mainz, this ancient castle (old engraving, above) built on late-Roman foundations between the 11th and 14th centuries now houses the *Rheingau Wine Museum, a must-see for any visitor to Rüdesheim. Displays here cover the entire scope of wine-making — and drinking — down through the ages. A short stroll along the river brings you to the passenger ferry dock (Personenfähre) (9). From here you can take a quick boat ride to Bingen, just across the Rhine. This was once the home of Hildegard von Bingen, the 12th-century composer whose works have become so popular in recent years. HISTORICAL MUSEUM — HILDEGARD VON BINGEN (12), T: (06721) 990-655. Open Tues.-Sun. 10-5. €. Bingen's favorite personality, the visionary, scholar, abbess, healer, writer, and composer Hildegard von Bingen, lived from 1098 until 1179; a life filled with remarkable achievement. Her legacy is celebrated in this riverside museum, whose other attractions include a collection of 2nd-century Roman doctor's instruments and a survey of the entire Rhine Romantic epoch. Return to the ferry dock and Rüdesheim. The train station is just across from the dock, but you will most likely want to enjoy a bit of wine sampling along the Drosselgasse before heading back to Frankfurt. Text and maps copyright © 2007 by Earl Steinbicker. Color photos courtesy of the Rüdesheim Tourist Office. CLICK HERE FOR ANOTHER SAMPLE CHAPTER FROM THE BOOK. CLICK HERE for a list of all the free Daytrips chapters you can download from this blog. And CLICK HERE for my Amazon Connections Page. My Daytrips Germany book, which went through six editions since 1983, was putting on weight from all that bratwurst und bier — so I decided to divide it into three regional books. The first two of these are now out and available. These new books are smaller and easier to carry, have more practical information than the previous one, and have all-new, clear, digitally-created local street maps for each and every one of the 23 daytrips — so you can hardly get lost. Also featured are restaurant suggestions, complete travel information, local history and attractions. All of the daytrips can comfortably be made from Munich or other nearby bases, by either rail or car. Some of the complete trip chapters are featured right here on this blog, so you can sample them before deciding to buy. CLICK HERE for the Daytrips Chapters Index, which will lead you to them. Visiting Bavaria? 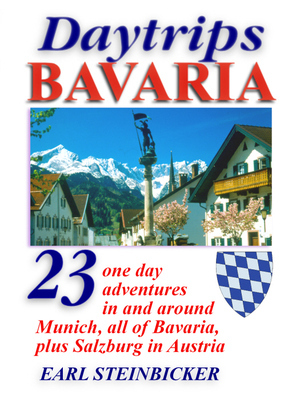 Check out my new (2014) app for the iPad, iPhone, and iPod Touch, Bavaria Travel: Munich & Great Day Trips. It's full of current, up-to-date information, special maps, day trips, walking tours, offbeat destinations, and much, much more. Another lovely lake within easy commuting distance of Munich is the Ammersee. More secluded than Lake Starnberg and virtually unkown to foreign tourists, it has the added attraction of a gorgeous rococo monastery at Andechs (photos, above and below right), which brews what many consider to be Germany's finest beer. This is the perfect daytrip for anyone who loves riding boats, walking quiet trails, and drinking fabulous brew in a convivial atmosphere. Like Starnberg, the Ammersee region has fine hotels and guesthouses that offer lower prices than those in Munich — a practical alternative to staying in the city. Trains on the S-Bahn commuter service leave frequently from the lower level of Munich's main station, after first making underground stops at Marienplatz, Karlsplatz, and other midtown stations. Take the S-5 line all the way to the last stop, Herrsching, a journey of about 45 minutes. Those without railpasses should follow the ticketing instructions on page 00. The tasty, strong beer at Andechs is a good reason to take the train. By Car, leave Munich on the A-96 Autobahn in the direction of Landsberg to the Oberpfaffenhofen exit, then follow local roads past Wessling and Seefeld to Herrsching. You can drive to Andechs instead of walking if you prefer, but remember to have a designated driver. 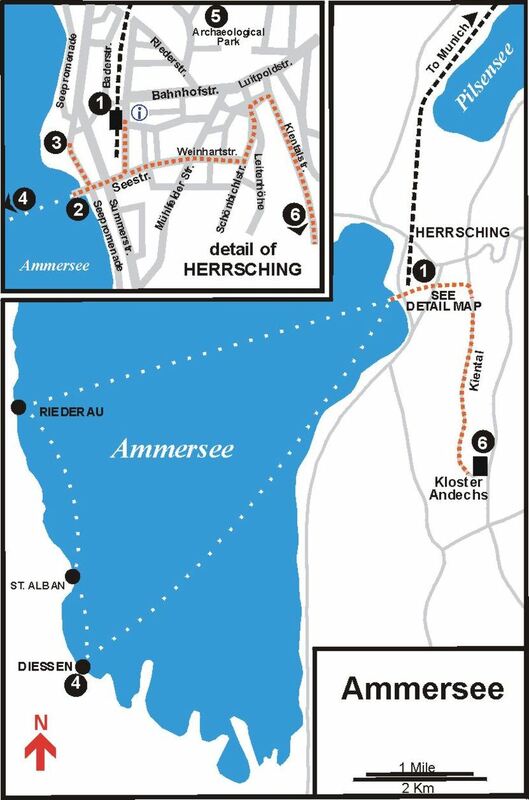 The Ammersee should be visited on a fine day in the summer season. This is a good weekend trip, especially on Sundays. The local Tourist Information Office(Verkehrsamt), T: (08152) 52-57, W: sta5.de, is near the Herrsching train station at Bahnhofplatz 2. Herrsching has some 10,000 inhabitants. Leaving the Herrsching train station (1), stroll over to the pier (2) and check the schedule of boats to Diessen. If you have a wait before the next departure you may want to visit the Kurpark (3) with its picturesque little castle. The boat ride to Diessen (4) takes a little over 30 minutes. T: (08143) 940-21,W:seenschifffahrt.de. Roundtrip €€. Sights to see there include the sailing school and the Stiftskirche (Abbey Church), a masterpiece of the Bavarian rococo style. If you're there on a weekend you might want to visit the small Carl Orff Museum, which explores the life of the famed 20th-century composer of the Carmina Burana and other works. Hofmarkt 3,T: (08807) 91-981. Open Sat.-Sun. 2-5. Return to Herrsching by boat. Before continuing on, you might want to visit the nearby Archaeological Park (5) with its reconstructed stone church from around AD 625, but inquire at the tourist office first to gain entry. 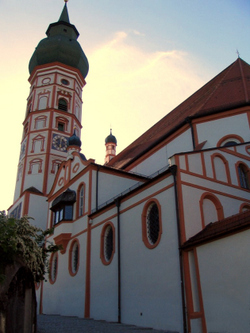 Now follow the map to St. Martin's Church, where the woodland trail to Andechs begins as Kientalstrasse. The two-mile walk to the monastery takes you through a lovely ravine and alongside a little stream. At the end it climbs up the Holy Mountain, a place of pilgrimage for centuries. 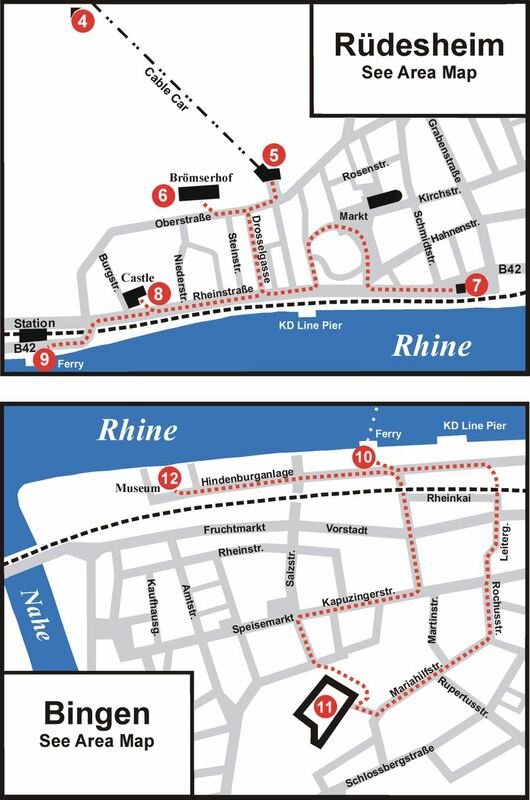 You can also get there by bus from the Herrsching station; ask at the tourist office for schedules. Those with cars can, of course, drive. *KLOSTER ANDECHS (6), T: (08152) 376-167, W: andechs.de. Open daily 7-7. Tavern, beer garden, restaurant. The Benedictine Monastery of Andechs overlooks the surrounding countryside from its lofty perch (photo, top of page). Originally a castle dating from the 12th century, it was later rebuilt as an abbey due to the discovery of important relics in its chapel. The present church was first constructed in the 15th century. In the mid-1700s, however, it was completely redone in the rococo manner, with frescoes and stuccoes by the famous artist J.B. Zimmermann. The result is simply dazzling — one of the very best examples of that style anywhere. While exploring the interior, be on the lookout for the tomb of the 20th-century composer Carl Orff (1896-1982), world-famous for his Carmina Burana. From here it is only a few steps to the Beer Garden, where the second reward of your pilgrimage awaits. The potent (11.5% to 18.5% alcohol!) brew is renowned all over the land. 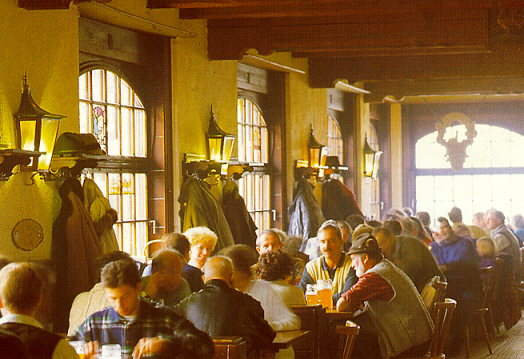 Join the queue for a one-liter stein (maß) and some snacks, then sit down at one of the indoor or outdoor tables for a rest before returning to Herrsching. For a full meal, try the adjacent full-service restaurant (Klostergasthof), where the prices are a bit higher but still very reasonable. Text and map copyright © 2009 by Earl Steinbicker. Or read the sixth edition of the book free at Google Books.